After the news last week that four APL ships were now accepting passengers The Cruise People Ltd are pleased to announce three more, bringing the number of APL passenger-carrying container ships to seven. One of the three newly-added ships sails Transpacific while the other two carry passengers only locally within Europe. Probably most interesting is the APL New York (above), which has opened up for passengers travelling between Los Angeles, Oakland, Tokyo and three Chinese ports, Qingdao, Shanghai and Ningbo, on a full round voyage of 42 days. A typical round voyage on this route costs €4,315 per person in double occupancy or €4,735 for sole occupancy, while the one-way trip from Oakland to Tokyo is 16 days, or €1,715 per person double and €1,875 for sole occupancy. This route harks back to the days of American President Lines, when the round trip was the same 42 days. Liners like the President Wilson (left) sailed from San Francisco to Honolulu, Yokohama, Hong Kong and Manila, with the return voyage calling at the same ports plus Kobe. There is a wonderful hotel in Oakland, right on San Francisco Bay, called the Waterfront Hotel. not only is it nice, but there is a regular 25-minute ferry service to and from downtown San Francisco and the hotel has a free shuttle that will take folks to the nearby port of Oakland and their ship. And it is only three blocks from the Oakland Amtrak station. For any cargo ship passengers coming to Oakland, this would be the perfect choice. Meanwhile, two more APL ships, the APL Charleston and APL Miami, offer a 15-night one-way voyage from Gioia Tauro in southern Italy to Tangier, Southampton, Rotterdam, Antwerp, Felixstowe, Dunkirk and Le Havre. Fares for this 15-night trip are €1,615 per person double and €1,765 single. These ships trade out to India and Pakistan but only accept passengers within Europe. Please apply to this office for fares and availability. Like the APL New York, these ships offer two Owners Cabins for passengers. APL is part of CMA CGM Group. For details of booking a cargo ship voyage on an APL or CMA CGM ship or any other line please contact Miri Lopusna at The Cruise People Ltd in London on +44 (0)20 7723 2450 or e-mail PassageEnquiry@aol.com. In order to celebrate the release of the film Gauguin – Voyage de Tahiti with Vincent Cassel this month in Paris, Aranui Cruises have announced a special offer on board the Aranui. The film nicely highlights the Marquesas Islands. An on board credit of €300 Euros per cabin has been allocated (except dormitories), usable on board (bar, shop, spa, fishing) for all new reservations made on trip N°3 (February 20, 2018). Don’t hesitate to contact us about this offer. The Aranui 5 entered service in December 2015 and makes regular supply voyages from Papeete, Tahiti, to the Marquesas and Tuamotu Islands, carrying up to 256 passengers per voyage. Apart from supplying cargo to the six ports in the Marquesas Islands, Aranui 5 also operates a passenger service and tourist cruise as part of its 14-day itinerary. It also stops at the islands of Rangiroa and Takapoto in the Tuamotu Islands before returning on its 13th day to Bora Bora in the Society Islands. For details of booking a cargo ship voyage on Aranui 5 in the South Pacific, or for any other line for that matter, please contact Miri Lopusna at The Cruise People Ltd in London on +44 (0)20 7723 2450 or e-mail PassageEnquiry@aol.com. Cunard Line’s new 3,000-berth cruise liner for 2022 Queen Anne or Queen Charlotte? Today, an announcement was made by Cunard Line that it had ordered a fourth ocean liner, for delivery in 2022. The 3,000-berth vessel will be based on Holland America Line’s “Koningsdam” platform. Elsewhere, Saga Cruises announced last week that it had ordered a second 999-berth ship, to be named Spirit of Adventure, from Meyer Werft in Papenburg. And finally, Crystal Cruises is calling time after two successful Northwest Passage transits and has made it known that the next such crossing would be made by its newbuilding, the 200-berth Crystal Endeavour, in 2019 or 2020. Last week, after some delay, Silversea finally announced that it would build a sister ship to the Silver Muse. This followed an announcement ages ago by Seabourn that it would build two ships of similar size, Seabourn Encore and Seabourn Ovation, for the same upmarket range. Elsewhere, after winning four expedition ship orders from Ponant, two from Hapag-Lloyd Cruises and a seventh from an unidentified owner,Vard has secured its eighth order for a similar ship, this time from Coral Expeditions of Australia. And a name from the past, APL, has re-entered the passenger trades after a very long absence, by starting to accept passengers on four of its modern container ships. The Cruise People booked their first APL passenger this morning, from Singapore to Fos sur Mer on the APL Gwangyang, and are working on their second, a 119-day round voyage booking on the APL Danube, serving the Columbus Jax route between Los Angeles and the US East Coast, both ways via the Suez Canal. Ports of call on the Columbus Jax route include Los Angeles – Oakland – Hong Kong – Yantian – Vung Tau – Singapore – Port Kelang – Colombo – (Suez Canal) – Halifax – New York – Norfolk – Savannah – (Suez Canal) – Port Kelang – Singapore – Jakarta – Laem Chebang – Vung Tau – Los Angeles – Oakland. When it was known as American President Lines, APL ran both Transpacific and Round-the-World cargo-passenger services as well as Transpacific passenger liners. History since then has seen a couple of changes in ownership. 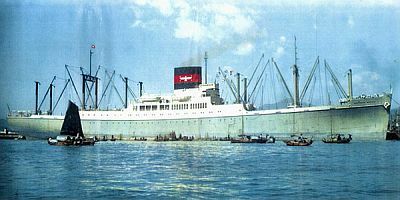 Neptune Orient Lines (NOL) was formed in December 1968 by the Singapore Government. In 1997, NOL acquired and merged with APL, with NOL becoming the holding company and APL the group’s world-wide container brand. In 2009, APL moved its headquarters from Oakland to Singapore, where it is based now. The APL container fleet now numbers 84 ships and APL’s Global Gateway South terminal in Los Angeles, also used by CMA CGM, moves 1.65 million TEU’s a year. In 2016, CMA CGM bought out Neptune Orient Lines and its APL operation, and they are now busy adding APL ships to their rosters. So far we have APL Columbus and APL Phoenix, with two Owners cabins each accommodating up to four passengers, and APL Danube (ex-CMA CGM Danube), with five double cabins accommodating up to ten passengers. All three operate on the the Columbus Jax service. A fourth ship to accommodate passengers is the APL Gwangyang, which is moving to the Mediterranean Club Express between Asia and Europe. No doubt more will follow. This year saw two ships come back after sixty years to revive a long-standing route that had first been opened 132 years earlier – that between Tampa, Key West and Havana. The 1,600-berth Empress of the Seas and 2,052-berth Carnival Paradise succeed to a route that had been started by Henry Plant with his Mascotte of 1885 and Olivette of 1887. The latter was the ship that took Churchill to Cuba in 1895 and the route was operated uniquely by one predecessor for more than seventy years befre being abandoned for sixty more. Meanwhile, last week in Hamburg saw the virtual keel-laying for AIDA Cruises’ 183,000-ton 5,200-berth AidaNova. On the other side of the Atlantic, Hurricane Irma has led to the cancellation of seventeen cruises counting for 40,000 lower berths from Florida ports. All of a sudden there is more activity on the Great Lakes, first with the announcement of the addition of Victory Cruise Line’ 202-berth Victory II for 2018 and then Hapag-Lloyd Cruises’ new 230-berth expedition ship Hanseatic Inspiration in 2020. Another expedition ship, possibly Ponant’s 184-berth Le Champlain, is also said to be on the way. And we have a quick look at two impending newbuildings, MSC Cruises’ 4,134-berth MSC Seaside and the 600-berth Seabourn Ovation, new sister to the Seabourn Encore.